— Campsis grandiflora or Bignonia grandiflora. It is Campsis chinensis that wildly grows in the Far East region of Asia (more precisely in China and Japan). "Is able", twisting a support with the ends of the escapes, to come nearer on it to the sky on 6 — 8 meters. Sometimes accepts an appearance of a low bush. It is delightful and in a standard form. — Campsis radicans or Bignonia radicans. It also had a name Tecomaria radicans. The plant comes from North America. Sticking to a support (even to a windowpane) in tens air backs released by stalks rises by height to 15 meters (to such "Guards" growth perfectly there correspond leaves — length reaches them 20 centimeters). And from the 1883rd the hybrid of these two types — Campsis Tagliba undertook to win wide popularity (Campsis × hybrida = Campsis × tagliabuana = Tecoma tagliabuana). It more often happens a bush, and to sprawling branches. 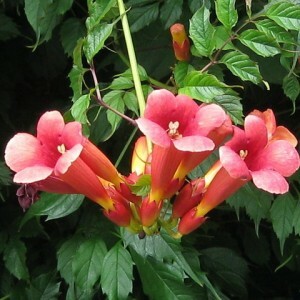 In size of flowers it is similar to Campsis grandiflora, on cold constancy degree — to Campsis radicans. Garden encyclopedia. Trumped vine cultivation.